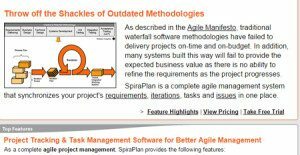 SpiraPlan is a full, all-in-one project management solution for managing project requisites, tasks, bugs/issues, releases, and tasks. Ready for deployment to your business operations, this entirely web-based platform offers an open platform that can integrate to your current tools or source code archives. SpiraTeam has this Agile Planning Board that is perfect for team meetings with color-coding and simple drag-and-drop editing. The software is designed specifically to support agile methodologies such as Scrum, Kanban, XP, Scrum, DSDM and AUP, allowing teams to manage all their information in one environment. Offers a consolidated user interface of major project status and health data. Provides a single, integrated view of reporting user interfaces of main project risk indicators and progress, including key risks and issues, task burnup / burndown, project velocity, effort slippage, and task progress. Browse linked source code repositories, including files and revisions. Every enterprise is different, and can need a specific Agile Project Management Software solution that will be fit for their company size, type of clients and staff and even individual niche they deal with. You should not count on locating a perfect software that is going to be suitable for every business regardless of their history is. It may be a good idea to read a few SpiraPlan reviews first and even then you should pay attention to what the solution is supposed to do for your company and your workers. Do you require a simple and straightforward service with only essential functions? Will you really make use of the advanced functionalities needed by experts and large enterprises? Are there any specific features that are especially beneficial for the industry you operate in? If you ask yourself these questions it is going to be much easier to find a trustworthy solution that will fit your budget. How Much Does SpiraPlan Cost? We realize that when you make a decision to buy Project Management Software it’s important not only to see how experts evaluate it in their reviews, but also to find out if the real people and companies that buy it are actually satisfied with the product. That’s why we’ve created our behavior-based Customer Satisfaction Algorithm™ that gathers customer reviews, comments and SpiraPlan reviews across a wide range of social media sites. The data is then presented in an easy to digest form showing how many people had positive and negative experience with SpiraPlan. With that information at hand you should be equipped to make an informed buying decision that you won’t regret. What are SpiraPlan pricing details? What integrations are available for SpiraPlan? If you need more information about SpiraPlan or you simply have a question let us know what you need and we’ll forward your request directly to the vendor.